Noz2Noz 669 Features: -Pet model N2 sof-krate. -Color: Sage green. 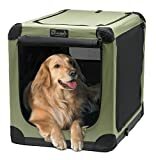 -For pets to 90 lbs. -Top, front and side entry doors. -Extra strong steel frame. -Heavy duty zippers with door lock. -Heavy duty ventilated mesh panels. -Durable water resistant base. -Rounded corners protect auto interiors and home decor. -Front entrance mesh rolls up and is secured by Velcro. -Dimensions: 32″ H x 28″ W x 42″ D.